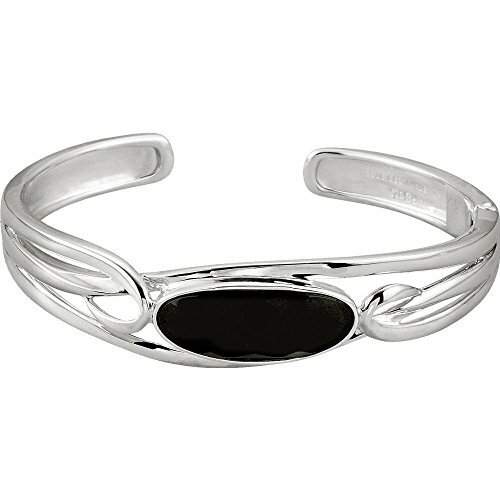 Onyx Hinged Cuff Bracelet in Sterling Silver by Eternity Wedding Bands at SCRHI. MPN: ST145. Hurry! Limited time offer. Offer valid only while supplies last. This sleek Sterling Silver Hinged Cuff bracelet exudes timeless sophistication. Featuring one 8.4CT Gemstone Onyx measuring 25x10mm in the center. This sleek Sterling Silver Hinged Cuff bracelet exudes timeless sophistication. Featuring one 8.4CT Gemstone Onyx measuring 25x10mm in the center. The bracelet measures 6.5" long and 66mm wide.